Samsung Mobile has today officially launched a new mid-range smartphone- the Samsung Galaxy A8 Plus in the Nepali handset market. The Galaxy A8 Plus is the latest addition to Samsung’s mid-range Galaxy A series and succeeds the last year’s Galaxy A7. The Galaxy A8 Plus features Infinity Display with 18:9 aspect ratio and dual-front cameras. The smartphone was first announced in South Korea in December. Design-wise, the Galaxy A8 Plus bears a strong resemblance to last year’s flagship Galaxy Note 8. The smartphone looks stunning with the combination of premium aluminum body and glass back. It features a large 6-inch FHD+ Super AMOLED display with a screen resolution of 2220 x 1080 pixels and an aspect ratio of 18:9. It is the company’s first smartphone to feature an 18:9 aspect ratio display. Powering the device is an octa-core Exynos 7885 processor based on 14nm technology which is clocked at 1.6GHz and clubbed with 6GB of RAM and 64GB internal storage. The phone does support storage expansion for up to 256GB via a microSD card. It is backed up by a 3,500mAh battery with adaptive fast charging support. On the software front, it runs on Android 7.1.1 Nougat operating system. The fingerprint sensor is placed on the back of the phone and also supports facial recognition feature as well. Moreover, the smartphone is also certified with an IP68 rating which makes it resistant to water and dust. In terms of connectivity, it supports WIFI b/g/n/ac, GPS/ A-GPS, Bluetooth 5.0, NFC, USB Type-C and Dual-SIM. As far as cameras are concerned, it features a 16 MP rear camera with f/1.7 aperture and PDAF and an LED flash. On the front, there’s a dual-camera setup which combines 16 MP sensor and 8MP sensor with an aperture of f/1.9. The Samsung Galaxy A8 Plus Price in Nepal is Rs.59,999 and comes in two color options- Black and Gold. 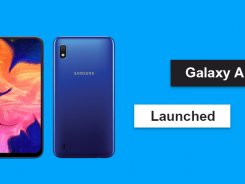 At the price of Rs.59,999 in Nepal, the newly launched Galaxy A8 plus will compete with the likes of OnePlus 5T and Mi Mix 2. What are your thoughts on the new Samsung Galaxy A8 Plus smartphone? Are you satisfied with the price? Let us know your thoughts in the comment section below.